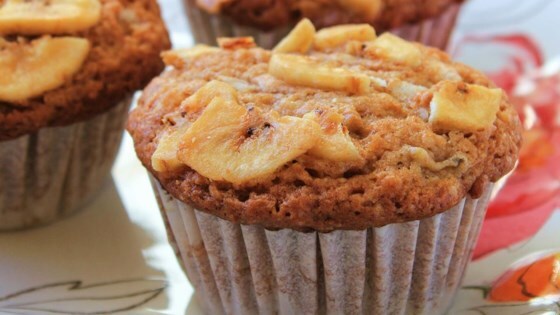 "This is a banana muffin with a crunch, with walnuts, granola, and coconut. Very tasty!" In a bowl, mix the flour, sugar, baking powder, baking soda, and salt. Mix in the eggs, milk, vanilla, and butter. Fold in mashed bananas, chopped banana, granola, walnuts, and coconut. Scoop into the prepared muffin cups. Sprinkle with banana chips. Bake 25 minutes in the preheated oven, or until a knife inserted in the center of a muffin comes out clean. Really delicious, but certainly not "healthy". With 2 cups of sugar and 1 cup of butter this muffin is sure to please the taste buds, but add pounds to any waistline. Fabulous. My whole family loves these--I added more bananas than called for and instead of granola, I used oats. delicious!